What does the idea of knowledge mean to you? OK, that’s a lot of words. Rather than parse its specifics, let’s look at the basis of “knowledge” using a variety of simple examples. Let’s take for an example the statement, the sky is blue. We can accept this as a factual statement (thus, assumed knowledge). But, we also know that the sky might be dark or black, if it is night. Or the sky may be gray if it is cloudy. Indeed, when we hear the statement that the sky is blue, if we believe the source or can see the sky for ourselves, then we can readily infer that the observation is occurring during daylight, under a clear sky. Our acceptance of an assertion as factual or being true carries with it the implications of its related contexts. On the other hand, were the simple statement to be le ciel est bleu, and if we did not know French, we would not know what to make of the statement, true or false, with context or not, even if all of the assertions are still correct. This simple example carries with it two profound observations. First, context helps to determine whether we believe or not a given statement, and if we believe it, what the related context implied by the statement might be. Second, how this information is conveyed to us is via symbols — in this case, the English language, but applicable to all human and artificial and formal notations like mathematics as well — which we may or may not be able to interpret correctly. If I am monolingual in English and I see French statements, I do not know what the symbols mean. Knowledge is that which is “true” in a given context or perspective. 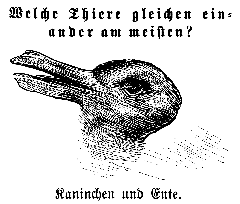 Is it a duck, or is it a rabbit? Knowledge may reside solely in our own minds, and not be part of “common knowledge”. But, ultimately, even personal beliefs not held by others only become “knowledge” that we can rely upon in our discourse once others have “acknowledged” the truth. Forward-looking thinkers like Copernicus or Galileo or Einstein may have understood something in their own minds not yet shared by others, but we do not “acknowledge” those understandings as knowledge until we can share and discuss the insight. (That is, what scientists would call independent verification.) In this manner, knowledge, like language and symbol-creation, is inherently a social phenomena. If I coin a new word, but no one else understands what I am saying, that is not part of knowledge; that is gibberish. In this example , we are highlighting the fact that different insects see objects with different wavelengths of light than we (humans) do. Bees see much more in the ultraviolet spectrum. The daisy flower knows how to attract this most important pollinator. The middle picture shows us how the color-blind person “sees”, with reds and yellows washed out . Or, let’s take another example, this case the black-and-white word for ‘bank’. We can see this word, and if we speak English, even recognize it, but what does this symbol mean? A financial institution? The shore of a river? Turning an airplane? A kind of pool shot? Tending a fire for the evening? In all of these examples, there is an actual object that is the focus of attention. But what we “know” about this object depends on what we perceive or understand and who or what is doing the perceiving and the understanding. We can never fully “know” the object because we can never encompass all perspectives and interpretations. Every knowledge structure used for knowledge representation (KR) or knowledge-based artificial intelligence (KBAI) needs to be governed by some form of conceptual schema. In the semantic Web space, such schema are known as ontologies, since they attempt to capture the nature or being (Greek ὄντως, or ontós) of the knowledge domain at hand. Because the word ‘ontology’ is a bit intimidating, a better variant has proven to be the knowledge graph (because all semantic ontologies take the structural form of a graph). In Cognonto‘s KBAI efforts, we tend to use the terms ontology and knowledge graph interchangeably. In general knowledge domains, such schema are also known as upper ontologies. However, one of the first things we see with existing ontologies is that they tend to be organized around a single, dyadic dimension, even though guided by a diversity of conceptual approaches. In the venerable Cyc knowledge structure, one of the major divisions is between what is tangible and what is intangible. In BFO, the Basic Formal Ontology, the split is between a “snapshot” view of the world (continuant) and its entities versus a “spanning” view that is explicit about changes in things over time (occurrent). Other upper ontologies have different dyadic splits, such as abstract v. physical, perduant v. endurant, dependent v. independent, particulars v. universals, or determinate v. indeterminate . I’m sure there are others. Ontologies are designed for specific purposes, and the bases for these splits in other ontologies have their rationales and uses. But in Cognonto’s case of needing to design an ontology whose specific purpose is knowledge representation, we need to explicitly model the nature of knowledge. Knowledge is not black and white, nor is it shades of gray along a single dimension. Knowledge is an incredibly rich construct intimately related to context and perspective. The minimum cardinality that can provide such perspective is three. If we return to the examples that began this article, we begin to see the interaction of three separate things. We have the actual thing itself, be it an object or a phenomenon. It is what is is. Then, we have a way that that thing is conveyed or represented. It might be an image, a sound, a perception, a finger pointing at it, or a symbol (or combination of symbols such as a description) of it. Then we have how that representation is perceived. It is in the interplay of these three separate things that something is “understood” or becomes “knowledge” (that is, a sign). This triadic view of the world was first articulated by Charles Sanders Peirce (1839-1914) (pronounced “purse”), the great American logician, philosopher and polymath. Peirce’s logic of signs in fact is a taxonomy of sign relations, in which signs get reified and expanded via still further signs, ultimately leading to communication, understanding and an approximation of “canonical” truth. Peirce saw the scientific method as itself an example of this process . 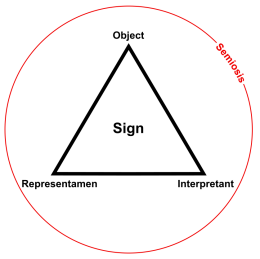 A given sign is a representation amongst the triad of the sign itself (which Peirce called a representamen, the actual signifying item that stands in a well-defined kind of relation to the two other things), its object and its interpretant. The object is the actual thing itself. The interpretant is how the agent or the perceiver of the sign understands and interprets the sign. Depending on the context and use, a sign (or representamen) may be either an icon (a likeness), an indicator or index (a pointer or physical linkage to the object) or a symbol (understood convention that represents the object, such as a word or other meaningful signifier). An interpretant in its barest form is a sign’s meaning, implication, or ramification. For a sign to be effective, it must represent an object in such a way that it is understood and used again. This makes the assignment and use of signs a community process of understanding and acceptance , as well as a truth-verifying exercise of testing and confirming accepted associations (such as the meanings or words or symbols). The key aspect of signs for Peirce, though, is the ongoing process of interpretation and reference to further signs, a process he called semiosis. A sign of an object leads to interpretants, which, as signs, then lead to further interpretants. The essence of knowledge is that it is ever-growing and expandable. New insights bring new relations and new truths. The structures we use to represent this knowledge must themselves adapt and reflect the best of our current, testable understandings. Peirce saw the trichotomous parts of his sign logic as the fewest “decomposable” needed to model the real world; we would call these “primitives” in modern terminology. Robert Burch has called Peirce’s ideas of “indecomposability” the ‘Reduction Thesis’ . The basic thesis is that ternary relations suffice to construct any and all arbitrary relations, but that not all relations can be constructed from unary and binary relations alone. Threes are irreducible to capture the basis of knowledge. With its express purpose to provide a sound basis for modeling knowledge, essential to knowledge-based artificial intelligence, Cognonto’s governing schema, the KBpedia Knowledge Ontology (KKO), is the first knowledge graph to explicitly embrace this triadic logic. Later articles will discuss KKO in much greater detail. Peirce’s logic of semiosis and his three universal categories provide the missing perspective of classing and categorizing the world around us. The irreducible truth of ‘threes’ is the essential foundation for representing knowledge and language. Similar senses are conveyed by the Wiktionary definition of knowledge. From Photography of the Invisible World (http://photographyoftheinvisibleworld.blogspot.com/2013/11/today-more-about-my-last-surviving.html). See, for example, Ludger Jansen, 2008. “Categories: The Top-level Ontology,” Applied ontology: An introduction (2008): 173-196, and Nicola Guarino, 1997. “Some Organizing Principles For A Unified Top-Level Ontology,” National Research Council, LADSEB-CNR Int. Report, V3.0, August 1997. M.K. Bergman, 2012. “Give Me a Sign: What Do Things Mean on the Semantic Web?“, AI3:::Adaptive Information blog, January 24, 2012. See further Catherine Legg, 2010. “Pragmaticsm on the Semantic Web,” in Bergman, M., Paavola, S., Pietarinen, A.-V., & Rydenfelt, H. eds., Ideas in Action: Proceedings of the Applying Peirce Conference, pp. 173–188. Nordic Studies in Pragmatism 1. Helsinki: Nordic Pragmatism Network. See Robert Burch, 1991. A Peircean Reduction Thesis: The Foundations of Topological Logic, Texas Tech University Press, Lubbock, TX. Peirce’s reduction thesis is never stated explicitly by Peirce, but is alluded to in numerous snippets. The essence of knowledge is that it is ever-growing and expandable. The structures we use for knowledge representation must themselves adapt and reflect the best of our current, testable understandings. 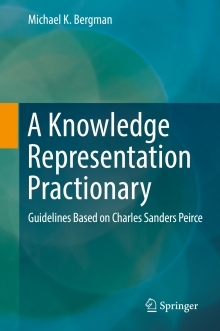 Cognonto's governing schema, the KBpedia Knowledge Ontology (KKO), is the first knowledge graph to explicitly embrace the triadic logic of Charles Sanders Peirce to capture this dynamic.